Have Ewe Any Wool? : Lights! Camera! Action! I've got pictures! My dear husband has graciously volunteered to take some pictures of this years creations for me. I have a few others that still need to be photographed, but I didn't want to take advantage of him....I promised to make the "photo shoot" as quick and painless as possible. I also have some pictures that are still on film....yes, I said film. There are still a few of us that are throw-backs to the old days of the 35mm camera....and the undeveloped film. I hope to "free" these images soon and scan them in for display as well. Going a bit crazy with socks....part of my attempt to whittle down the stash a bit. The socks I'm wearing in the picture were made from Lang Jawoll wool sock weight yarn in a dark blue with turquoise bits. 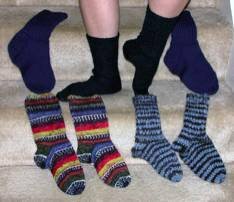 These were made using the Fiber Trends "Hellen's Favorite Socks" pattern - a 3/1 rib using size 1 1/2 needles. The blue striped socks were made with Idena "Crazy" on size 4 needles using the "Crazy Socks" pattern. Both the Jawoll and Crazy socks were started and finished this month. The wild colored socks were made from Fortissima Colori Socka sock weight yarn using size 2 1/2 needles. These "uglies" were completed in February. However, I must admit that one sock (and the top of the second sock) was completed about 3 years ago....but since I didn't really like the colors (especially the yellow with the smudgy black throughout), I let them "fester" until "stash busting" got the best of me. I used the freebie Socka pattern to make these. The final pair of socks, the royal blue solid ones, were made from Jo Sharp 100% DK weight wool. I actually completed 1/2 of the ribbing of the first sock about 1 year ago while keeping a friend company at the hospital. I used the basic sock pattern I got when I took the sock class at Hunt Country Yarns a few years ago. These socks knit up super fast because I got to use size 5 DPNs. Wahoo! It feels so good to finally finish some of my UFOs as well as use up a few skeins from my stash! On the right is a picture of a couple my favorite creations from this year - a felted purse and a warm, cuddly hat. The felted bag is the "Sophie Bag" (pattern available from the Mag Knits website). I made it out of purple Cascade 220. I LOVE the twisted handle. My big dilemma now is how to finish it. The bag is fine as is, but I could "embellish" it a bit. Should I add a button at the top? Or should I create felted flowers and artfully attach them to the bag? What if I embroider a flower on it? Or....needle felt a an artsy design on it? Decisions, decisions. Ah....the "Big Cossack". I LOVE this hat! The pattern is from the book "Folk Hats" by Vicki Square. The pattern calls for Mountain Colors Moguls and Cascade Magnum. However, I fell in love with the Mountain Colors Mohair Loop at Capital Yarns and used that instead of the Moguls and a double strand of Lamb's Pride Bulky instead of the Magnum. The Mohair Loop had a lovely sheen that was not present in the Moguls. 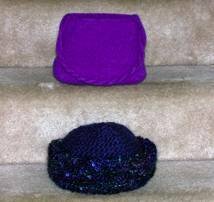 I was VERY pleased with both the appearance and the fit of the finished hat....as well as the "cuddliness"! The scarf is made from Crystal Palace Fizz Stardust. It's white with silver metallic mixed in (sorry....the picture doesn't capture this well at all.). The scarf was made entirely while riding in a car. It's a very easy pattern (plain ol' garter stitch on large needles), but produces a rather elegant scarf thanks to the wonderful yarn. The hat is made from variegated Red Heart acrylic. 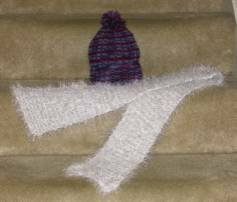 It's a basic ribbed hat topped off with a pom-pom. I intend to donate it to a worthy charity. Hi Jinann - love all the new photos! Tell the hubby he takes great pics. Now he needs to buy you a nice digital camera for your birthday! I vote for a cool needle felted pattern on your Sophie purse. I haven't needle felted yet myself, but I have a purse waiting in the wings that I am going to get up the nerve to try it on one of these days. Love the site and the photos - keep posting, we love reading about (and seeing) what you are doing. Socks! Socks! And MORE Socks!